Win Odds: iHoldem Indicator win poker odds are calculated with a sophisticated mathematical algorithm based on your pocket cards, the community cards, and the number of players in the hand. iHoldem Indicator offers accurate win poker odds that you can trust. You can change the display format to "Ratio" in the settings window after you click "Options" > "Odds Display Format". Pot Odds: Pot odds is simply a ratio of the amount of money in the pot compared with how much money it takes to call. The higher the ratio, the better your pot odds are. If there are $12 in the pot and it costs $4 to call then you are getting 3:1 odds ("cost to stay in"). This can be translated to a percentage, representing the size of your contribution in the new pot. It will be 25% in the above example. You can change the display format in the settings window after you click "Options" > "Odds Display Format". Hand Odds: iHoldem Indicator displays the probabilities of hitting a particular hand at showdown for you and your opponents at showdown. For example, if it shows 20 on flush for you and 30 for your opponents, it means that you have a 20% probability of getting your flush, while your opponents collectively have a 30% chance of hitting a flush. 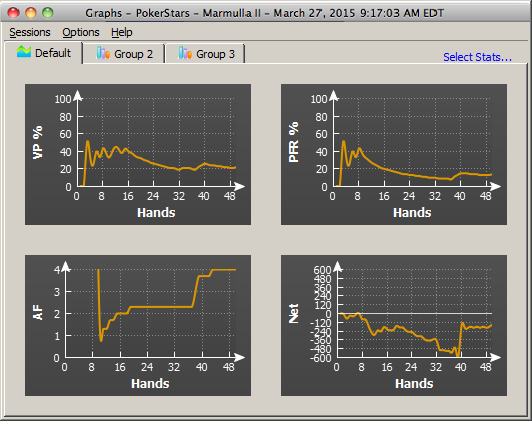 Starting Hands Strength: iHoldem Indicator provides EV, Sklansky Group/Rank and Win Odds for your starting hands. They're all independent numbers. You can choose the one you prefer to play your own starting hands. EV: Expected Value for your hole cards. Expected value is the average amount of big bets this hand will make or lose. These statistics were compiled by a major online poker room from their database of millions of real live hands. So, for example, AA from the small blind in a 3/6 game will make on average 2.71 times the big blind, or $16.20 per hand (2.71 * $6). 22 from the button however, will make -0.12 EV, or -$0.72 in a 3/6 game (6 * -0.12). By only playing poker hands that have profitable EV, you will certainly improve your Texas Hold'em game. Please remember however, that this is a compilation of EV for the average player, so they are just representative of long term statistics and not Texas Hold'em facts. You will still need to play your poker hands accordingly, which means you need to observe your opponents, and play as the flop sees fit. Here are the Expected Value hand charts for 2 Players, 6 Players, 10 Players. Group/Rank: This is another way to describe your hole cards' strength. In the book of Hold'em Poker for Advanced Players by David Sklansky, he divides the starting hands into 9 groups. This is a strategy book for limit Hold'em, but the starting hand groups do have some practical use in no limit Hold'em. Group 1 is the strongest; Group 9 is the weakest. You can get the whole list of the Sklansky Groups. For PokerStars and Full Tilt (only), we use "Rank" to indicate the absolute strength of your starting hand, 1-169, 1 is the best hand. Holdem Indicator converts it into percentage as "top %". You can get more information about the starting Hand Ranks. OUTs: OUTs refer to the unseen cards still left in the deck that will improve your hand after the flop. As you might guess, the more cards left in the deck that will improve your hand, the better. That's why, after the flop, you want to stay with hands that can be improved in a number of ways. The more outs, or ways your hand can potentially improve on the Turn or the River, the better your chances are of winning the pot. By counting your outs, you can do a very rough, quick calculation to estimate your chance of improving your hand after the flop, and hopefully having a winning hand. Knowing how likely (or unlikely) you are to improve will help you make a better decision about how much (or little) to invest in the hand. iHoldem Indicator shows you the total outs and what the outs are. iHoldem Indicator displays the OUTs from the strongest to the weakest. So you can easily ignore the weak ones if you wish. Keep in mind that iHoldem Indicator doesn't calculate Win Odds based on OUTs. They're independent. You can use either of them to judge your hand strength. Position: iHoldem Indicator shows your position after flop. For a full size table (7-10 players), the first three seats after the button would be Early. The button and the two seats before it would be Late, and in between is the Middle. For short-handed tables (5-6 players), Early and Late position are the first and last two positions. For tables with 2-4 players, Early and Late position are the first and last position. iHoldem Indicator stores Player Stats automatically on your computer. The stats will be loaded automatically next time you're sitting with a tracked player (if you choose to display the history stats option). This data is collected using the same information you receive while sitting at the poker table. iHoldem Indicator does this by reading the log files supplied by the online poker rooms themselves. The major difference is that iHoldem Indicator actually remembers the action and automatically recalls it for you. Top professionals have amazing card memory - so can you! Play money, real money, and tournament stats are tracked and displayed separately. #H: The total number of hands tracked. VPIP (Voluntary Put Money In Pot): Percentage of games a player voluntarily puts Money in the pot pre-flop. Blinds do not count unless a player completes small blind or calls a raise or raises from either blind. It measures a player's tightness/looseness, which helps indicate the range of hands that the player will see a flop with. Green for Tight, Black for Neutral and Slightly Loose, Red for Loose. Below are the default settings. 3Bet/F: 3Bet pre-flop. % of times a player raises pre-flop when facing a raise. It includes 3Bet, 4Bet, 5Bet, etc. /F: % of times a player folds when facing a 3Bet. It applies to the 1st raiser only. 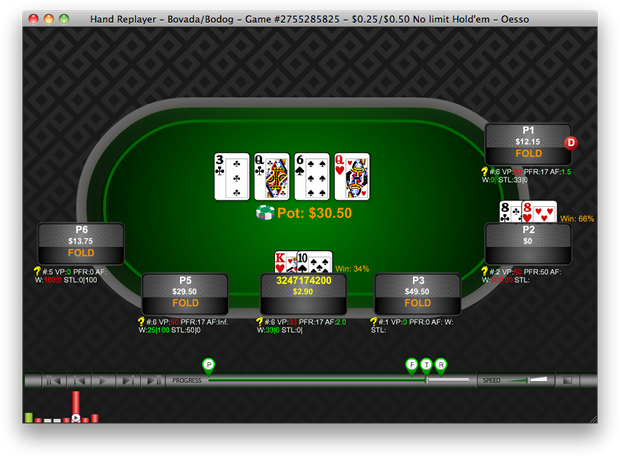 In case that hand is a 4bet hand eventually and the 1st raiser folds, it's not a "Folded to 3Bet pre-flop". 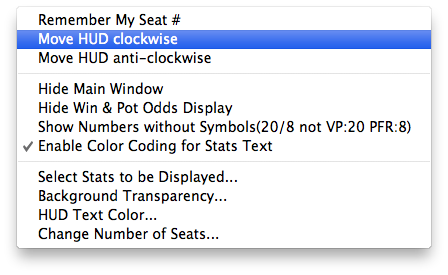 Steal/F: % of time a player raises unopened pot pre-flop from the CO (Cutoff), Button and SB position. A steal can only be made if everyone in front of the stealer folds so that the stealer is making the first bet pre flop and only from the cutoff, button or small blind. If there is a limper in front and the steal position player raises, that is classed as "raising limpers" and not "stealing". /F: % of times SB/BB folds when facing a steal. AF (Aggression Factor): It measures a player's aggression/passivity, which represents the player's betting tendencies after the flop. iHoldem Indicator provides a combined AF for flop, turn, and river. If a player makes some raises and bets but never calls, the AF will be displayed as Inf, which means "infinite". Red for Passive, Black for Neutral, Green for Aggressive. Below are the default settings. CBet/F: Continuation bet on flop. % of time a player bets the flop after being the pre-flop raiser. A CBet can only be made when there are players to act before the pre-flop raiser, if those other players all check to the pre-flop raiser. /F: % of time a player folds to a continuation bet on flop. WSD/W: To further categorize players, we use "Went to Showdown %" to measure whether a player is Solid or Overplay. It is based on the hands when saw flop. Green for Solid, Red for Overplay. Below are the default settings. /W: Went to Showdown and Won percentage. Net: The chip amount that this player is up or down for all hands tracked. It is very interesting to observe how different playing styles (see VPIP, AF, etc) correlate with winning or losing patterns. Also, the balance may represent additional useful information regarding the player's current mindset (who is more likely to "play it safe", who is getting desperate, who is about to "go on tilt" etc). Profiling Icons: (This feature is unavailable for PokerStars and Full Tilt) iHoldem Indicator may assign a profiling icon to a player when it collects more than 40 (by default) hands of data for that player. Below is the list of all the profiling icons and the corresponding criteria. You can change the profiling thresholds. Click "Stats" > "Player Profiling Settings". Calling Station (Slightly Loose, Passive). Voluntary Put Money in Pot % is between 28% and 33%; Aggression Factor is less than 1.00. Fishy (Loose, Passive/Neutral). Voluntary Put Money in Pot % is greater than 33%; Aggression Factor is less than 1.50. Gambler (Slightly Loose, Aggressive, Overplay). Voluntary Put Money in Pot % is between 28% and 33%; Aggression Factor is greater than 1.00; Went to Showdown % is greater than 39%. Good Player (Tight, Aggressive, Solid). Voluntary Put Money in Pot % is less than 24%; Aggression Factor is greater than 1.50; Went to Showdown % is less than 39%. Loose, Aggressive. Voluntary Put Money in Pot % is greater than 33%; Aggression Factor is greater than 1.50. Neutral, Aggressive, Overplay. Voluntary Put Money in Pot % is between 24% and 28%; Aggression Factor is greater than 1.50; Went to Showdown % is greater than 39%. Neutral, Aggressive, Solid. Voluntary Put Money in Pot % is between 24% and 28%; Aggression Factor is greater than 1.50; Went to Showdown % is less than 39%. Neutral, Passive/Neutral. Voluntary Put Money in Pot % is between 24% and 28%; Aggression Factor is less than 1.50. Slightly Loose, Neutral. Voluntary Put Money in Pot % is between 28% and 33%; Aggression Factor is between 1.00 and 1.50. Rock (Tight, Passive, Solid). Voluntary Put Money in Pot % is less than 24%; Aggression Factor is less than 1.00; Went to Showdown % is less than 39%. Slightly Loose, Aggressive, Solid. Voluntary Put Money in Pot % is between 28% and 33%; Aggression Factor is greater than 1.50; Went to Showdown % is less than 39%. Tight, Aggressive, Overplay. Voluntary Put Money in Pot % is less than 24%; Aggression Factor is greater than 1.50; Went to Showdown % is greater than 39%. Tight, Neutral. Voluntary Put Money in Pot % is less than 24%; Aggression Factor is between 1.00 and 1.50. Tight, Passive, Overplay. Voluntary Put Money in Pot % is less than 24%; Aggression Factor is less than 1.00; Went to Showdown % is greater than 39%. Not sure yet. Not enough hands of data to categorize this player. Filters: For history stats, you can set up the criteria to display the preferred data. Click "Stats" > "History Stats Filters". Player Notes: In the player stats window, double click on a player's name, you can add/edit or view notes for that player. On the HUD overlay, click the profiling icon. Once a player has notes, there will be a "sign" on the player name or the profiling icon. The notes data will be kept locally on your computer. iHoldem Indicator offers the MZone feature for tournament games. The "M" will be displayed in the stats window and on the HUD. The "M" score is a ratio of your stack to the blinds and antes and dramatically affects your starting hand selection and strategy. iHoldem Indicator calculates everyone's MZone score at your table, giving you a huge advantage when it comes to exploiting those opponents' mistakes. iHoldem Indicator displays player stats, win/pot odds and mucked cards seamlessly on your game table. iHoldem Indicator has a stable, smooth, easy to use HUD. No complex configuration is needed. Right Click on the stats area, it will popup a menu with a bunch of options where you can configure your HUD settings, move the HUD seat positions, etc. If you're using a different theme for your game table, the default HUD overlay might not be in the right positions. You can drag the stats to a proper location you prefer. The new positions will be remembered by HUD. The 3 blue characters match the first 3 characters of the player name. So you can tell whether the HUD positions are correct. "Change Number of Seats" : On some sites, you need to choose the number of seats(2,6,9...). Don't check the option "Always use the number selected" if you play at tabels with different number of seats. Holdem Indicator reads the mucked hands information from the hand history files. If there are some mucked cards in a game, the poker client will write this information to the hand history file. Then Holdem Indicator will read and display them. Keep in mind that not every hand has the mucked cards. For the "Mucked Hands" feature to work well, you need to enable the instant/local hand history option in your poker client and put the language to English. The "Mucked Hands" feature is available for Party Poker, Full Tilt, PokerStars, Merge sites. Click menu "Tools" > "Manual Calculator". Double Click on the cards display area, you can launch the Manual Calculator. During play, you even can replace one card to another by double clicking it. Click menu "Tools" > "Hand Replayer". You can visualize hands you played with Player Stats and Win Odds for yourself and players with known cards. Works with Bovada and other sites. "Sessions" Menu: Select a session to replay or delete an old session. "Options" Menu: You can change a bunch of options to customize your Hand Replayer. Click menu "Stats" > "Stats Graphs". You can review your sessions with graphs. "Sessions" Menu: Select a session to review or delete an old session. "Options" Menu: You can change a bunch of options to customize your Graphs. Click the "View" menu or right click on your iHoldem Indicator. You can switch it between "Horizontal View" and "Vertical View", "Odds Display" and "Player Stats". Find New Game Tables Automatically: By checking this option, iHoldem Indicator will launch new instances automatically for your new game tables. Move with the Game Table: iHoldem Indicator will move itself with the game table automatically when you move your game table. Four Color Deck: Displays your hole cards and the board cards with a 4 color deck on iHoldem Indicator. Close iHoldem Indicator when Game Table is Closed: So you don't have to manually close iHoldem Indicator every time. Resize iHoldem Indicator when Game Table is Resized. Work with Bovada/Bodog only: iHoldem Indicator will work Bovada/Bodog game tables only. Click the "Stats" menu or right click on the stats window. Stats Graphs: You can review your sessions with graphs. 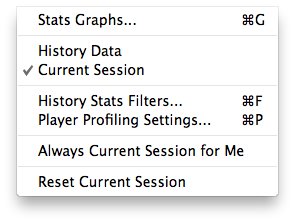 Switch between "Current Session" and "History Data"
History Stats Filters: For the history player stats, you can set up the criteria to display the preferred data. Player Profiling Settings: You can change the player profiling thresholds. Always Current Session for Me: If you select this option, iHoldem Indicator will always display your own stats for the current session even you select "History Data" option. Reset Current Session: If you click it, the player stats will be reset to 0 for the current session. Enable or disable HUD display on the game table. Hide Main Window when HUD is shown: You can hide the main window of iHoldem Indicator. Hide Win & Pot Odds Display: Only player stats will be displayed on the HUD. 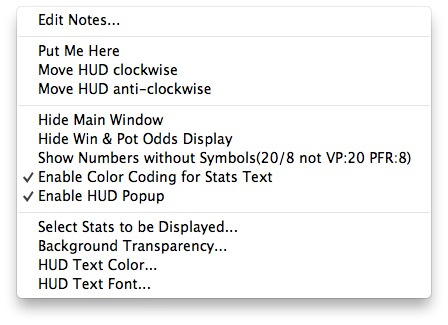 Show Numbers without Symbols: By default, HUD displays stats as something like "VP: 20 PFR: 8". You can choose to use "/" as a delimiter. So it will be displayed as "20/8". You can save some space by this way. 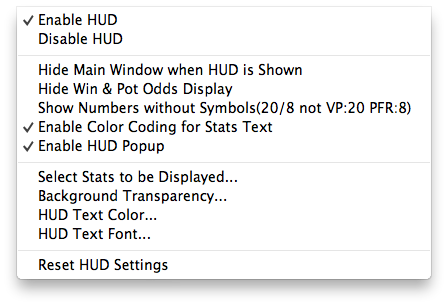 Enable Color Coding for Stats Text: By default, HUD displays the stats text with different color when the value is more or less than a threshold. You can choose to disable this option. Select Stats to be Displayed: To save the HUD space, you can choose which stats items to be displayed. Background Transparency: You can change the background transparency of HUD. HUD Text Color: You can change the HUD text color. Reset HUD Settings: You can reset all seat positions and other settings to the default ones. Right Click on the stats area, it will popup a menu with a bunch of options where you can configure your HUD. Edit Notes: Edit notes for that player. You can also set a special color for the player name. "Put Me Here", "Move HUD clockwise", "Move HUD anti-clockwise": If you use the "Preferred Seat" option on some site, HUD sometimes can't detect the seat number for each player. In this case, you can use these menus to rotate your whole HUD position to the proper seat. You can use "Rememeber My Seat #" menu to rememeber your seat position. So you don't have to rotate it every time. Thanks a lot for the nice work! You guys made a great program again ! It works great with PokerStars. I finally don't have to run Parallels when playing poker with my MacBook. Again, thank you very much! Yeaaaaha, it works. Great man. Fantastic support. U earned the money u get very well. best regards and good night. Copyright ©2013-2018, iHoldemIndicator.com, All Rights Reserved.